"The migration of an architecturaL style from an area to another foreign area is something that should be rejected because it will cut its relations to its heritage, traditions and culture. It leads to double personality and the loss of one's identity, thus to be a stranger in your house is the worst type of stranger." Besides being a town on the old caravan route from Iraq to Oman, Dubai was also a transit port for dhows between India east Africa and the northern part of the Gulf. Gradually it developed into a busy commercial centre where people of different cultures and traditions settled and mixed, leading to today's multi-cultural society. "Like most Arabian Gulf coastal cities, Dubai was established on land near a creek and fresh water. Creeks provided natural ports for dhows, and the sea was a convenient way of transportation, besides being a means of providing food and pearl diving," explains Rashad M. Bukhash, head of historical buildings section at Dubai Municipality. Speaking at the Architectural Review conference in the Middle East: Modernity and Tradition in Architecture held at the end of May in Dubai, Bukhash explained how Dubai's traditional architecture is a result of the mixture of nationalities of people who lived here.
" In general it is influenced by Islamic architecture which developed in the region. Its main features are simplicity, functionality, durability and suitability for climatic environments and social life. The courtyard houses are an aspect of Islamic architecture and are well suited to the local climate," he said. Many elements of the architecture are imported from neighbouring countries, such as the wind-towers and decorative panels from Iran as well as carved doors and balconies from India. The first thorough description of Dubai was given by the British Lieutenant Cogan in 1822, who recorded that the population then was around 1200 people, that there was a low wall around the town with three watch-towers and that the houses were made of mud. Lieutenant Cogan drew the first map of Dubai city and its elevation from the sea. In 1841 smallpox broke out on the Bur Dubai side of the creek and as a result people moved to Deira side and started to build houses and markets. Consequently, Deira became larger than Bur Dubai. In 1894 fire swept through Deira, burning down most of the dwellings. Richer people began building their houses from coral stone and gypsum which was more fire resistant. G.G. Lorimer is considered one of the best historians and geographers to describe the Arabian Gulf at the beginning of this century. He recorded the statistics of Dubai in 1908 as follows: "There is no customs, the yearly revenue is $51,400 mainly from pearls. In Deira side there are 1600 houses and 350 shops. In Shindagha area there are 250 houses. In (Bur) Dubai there are 200 houses and about 50 shops. There are about 4000 date palm trees in the town, 1650 camels, 45 horses, 380 donkeys, 430 cattle and 960 goats. In the creek, there are 155 boats for diving and trading and 20 small boats - abras- to take passengers between the two banks of the creek." At the beginning of the century, Dubai became a main trading centre in the Arabian Gulf where dhows handled the import and export of goods between the ports of India and east Africa. The main income was from pearls which people used to dive for in the hot summer months. The city expanded during this period, the population increased and Dubai experienced a construction boom. However, the pearl trade started to decline after Japan produced cultured pearls n 1930 and the economy began to deteriorate. The 1930s and '40s were slow years for Dubai. The introduction of cultured pearls by Japan on the one hand, and the start of the second world war on the other, led to widespread economic depression. Consequently, people migrated to neighbouring countries such as Saudi Arabia and Kuwait where more job opportunities were available. The population dropped significantly from 38,000 in 1940 to just 20,000 in 1953. The first oil agreement was signed with Britain in 1937 to search for oil in Dubai on land. Thirty years later, oil was discovered offshore. The first production was in 1969. Oil discovery increased the Emirate's income and subsequently, major infrastructure projects were embarked upon. Cement was first imported to Dubai in 1955 and the first concrete building was built in 1956. Cement was much cheaper than gypsum, which was traditionally used for building construction, so that in a few years the tradition of constructing buildings with coral stone and gypsum vanished and replaced with ready-made cement block construction. This was the beginning of a new era where traditional ways and forms of architecture were abandoned and new modern styles adopted. The traditional architecture of Dubai was basically the result of three main factors: the hot and humid climate, people's social lives and religion, and locally available construction materials. In response to the hot and humid climate, three architectural elements are visible. As in most Islamic cities, buildings were constructed close to each other. This type of high-density structure created narrow alleys, known as sikkas, which were shaded for most of the day. These alleys tended to run from north to south and ended at the creek, permitting the prevailing north winds to pass through. The narrowness of the alleys caused the wind to increase in velocity as it breezed through, creating a comfortable pedestrian zone. The second element, is the courtyard house, where most of the rooms look inward with shaded verandahs overlooking the courtyard. The courtyard generated wind movement in the house by allowing hot air to ascend the cooler air to replace it from the surrounding rooms. Wind-towers (bastikiyya) were a unique and elegant architectural element, acting as conduits for the trapped air to be directed to the rooms beneath. Usually bed and sitting areas were situated directly under the wind-tower to enjoy the cool air coming through. In winter, these wind-towers were boarded up with wooden planks to protect the room from rain. The effect of religion and social interaction on local architecture can be observed in two ways. Islamic religious teaching encourages privacy and modesty, and courtyard houses fulfilled this condition by providing an inward-looking house. All the rooms were open onto the courtyard and the exterior walls were mostly solid except for some small ventilation openings quite high up, preventing pedestrians looking in. The zigzag entrance to the houses, where the main gate was faced with a solid wall to provide privacy and prevent people from staring in, is another facet of that. Air pullers are a unique piece of local architecture. To avoid opening windows to the exterior, the architect Ostaad overcame the problem by replacing the opening of the window with two thin parallel walls with a distance of about 10 centimetres in between them. This design enabled the wind to strike the upper wall, be deflected into the opening and then pass though the lower wall into the adjacent room, providing both air and privacy to the occupants. The vernacular architecture in the region depended totally on the locally available materials. In the mountainous areas the oldest houses were made from stones put on each other simply to make a wall and occasionally the gaps were filled with mud. The roofs were covered with palm tree trunks and fronds. Later on, walls were made from small mountain stones and mud was used as mortar, roofs were covered with palm tree trunks and mats were made from palm tree leaves and mud. In the desert, bedouins moved from one place to another looking for water. Therefore, their houses had to be portable and easy to dismantle. Tents made from camel hairs were the best choice. Camel hairs were dyed in several colours using natural plants, dried and then woven into colourful tents- "bait shaar". In areas where Bedouins stayed for long periods of time, they used palm tree fronds and trunks to make their dwellings. In urbanised areas, two types of construction prevailed. Buildings made from coral stones and gypsum tended to be either public institutions, such as watch-towers, mosques and markets, or houses of rich people. Coral stones were collected along the shore or dug up from the sea while gypsum was made on the outskirts of the city. Gypsum stones were collected and burned for a few days, then ground into powder and mixed with water when applied to a building. Ceilings in earlier houses were covered with palm tree trunks, mats and gypsum. At the beginning of the century when Dubai trade was at a peak, palm tree trunks were replaced with sandalwood joists imported from east Africa. In the 1920s and'30s when trade with India flourished rectangular wooden joists, known as morrabaa, were imported from south India. "Morrabaa was the preferred wood as it was longer and stronger than sandalwood joists.In some cases, the roof was laid with a layer of burned mud "sarooj", which was introduced from Iran and proved to be waterproof,@ Bukhash said. In mountain areas where mud was available, sarooj was made by mixing mud with hay and cow manure, burned for a few days, then powdered and mixed with water. Doors and windows were made from solid teakwood imported from southern India and carved with geometrical decorations. Decorative items used in arches, wind-towers, rooms and architrave were made from gypsum powder. The decorative panel was poured on a flat surface, geometrical or floral designs were cut or carved onto the mould and then it was fixed in its position with gypsum mortar. The second type of construction used in the city were houses made of palm tree trunks and fronds, locally called areesh or kheima. Lower-income citizens lived in these houses. The main structure was made from palm tree trunks and the walls and ceilings were made from "daen", dried palm tree fronds tied together with kombaar, rope made from coconut tree fibres. In some cases, the fronds were cleaned of leaves to give more beauty and stability. Some of the houses had a portable wind-tower over the main room, the skeleton of which was made from palm tree trunks covered by a sack. The wind-tower was used in summer and in winter it was dismantled and the opening in the ceiling was covered with palm fronds. According to Bukhash, urban buildings could be divided into four categories: defensive, residential, markets and mosques. "Defensive architecture is the most prominent because it was the largest in scale. At the beginning of the 19th century Dubai was a small town with roughly 800 inhabitants," he says. Dubai was surrounded with a 2.5 metre high ad 60 centimetre thick wall made from what were considered to be the strongest available materials, coral stones and gypsum. The main fort Al Fahidi, built in 1799, was located inside the town and was used as a residence for the ruler and a place of shelter for the people whenever they were attacked. There were two types of residential buildings: the palm tree frond houses "khaima" for the low income people and the large courtyard houses made from coral stone and gypsum for the rich people. In the 19th century, most of the houses were of one storey only. At the beginning of this century when Dubai opened its doors to international trade, many merchants settled in Dubai and started building two storey houses. Wind-towers and toilets were introduced into the houses in the 1920s. The houses were close to each other with narrow curved alleys in between them, creating a strong neighbourhood. Each building housed a large family consisting of parents, sons and their wives and children. 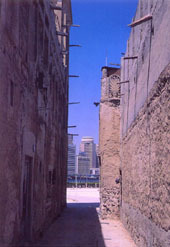 Since Dubai was the city of traders, numerous markets "souqs" and storage areas were built on both banks of the creek. As in most Islamic cities, similar traders joined together to create specialised markets named after them, such as the gold souq, the animal markets, the herb sellers. Markets consisted of a main street or alley shaded with palm tree fronds or mats, with gates on the two ends that were closed after sunset. Shops were constructed from coral stones and gypsum on both sides of the street, about three metres wide and four metres high, with tow large leaf doors. In the 1950s larger shops were constructed made of two adjacent spaces with one wind-tower over it to reduce the heat of the summer. Mosques were built in both residential and commercial areas to enable people to perform their prayers five times a day, while people gathered every Friday for prayer in the grand mosque on the Dubai side. This mosque was the most elegant building in the town with its 52 small domes and a short minaret. In residential areas, small mosques were constructed from coral stones and gypsum. Since there was no need for privacy in religious buildings, windows covered all exterior walls to collect breezes from all directions and ventilate the space. Aside from worship, mosques were used as schools where children learnt Quran, writing, reading, religious affairs and mathematics. In the 1960s, simple designs were introduced as well as cement blocks and reinforced concrete. Some of the buildings in this period were school and governmental like Dubai municipality buildings and lands department. Dubai's clock tower and the flame round-about commemorating the discovery of oil were constructed during this time. After the production of oil in 1969, Dubai witnessed the beginning of the boom. During the 1970s, many infrastructure projects including roads, drainage, housing and commercial buildings, were started. Dubai's population surged from 60,000 to 206,000 between 1967 and 1977. Because of the rapid construction in this decade there was no guide to control the type and shape of architecture, different international designs and style were produced. Some of the major projects constructed in this decade are Rashid hospital, the Dubai world trade centre (39 floors), Shindagha tunnel, Al Garhood bridge, the dry docks and Jebel Ali port as well as the airport. 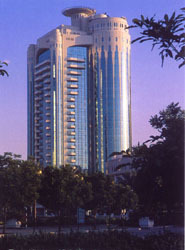 1980s witnessed more infrastructure projects and more modern buildings with some relation to local culture. Some of the local architects graduated and stared designing buildings with reference to traditional architecture. Dubai municipality had shade and water pools introduced into its buildings while Al Wasl hospital used traditional arches. The first renovation project was Sheikh Saeed Al Maktoum's house, which now houses a photography museum. The decade of the 1990s is considered to be the maturing stage of Dubai architecture, where most of the main buildings are designed with some respect to the traditional culture and heritage. More than 40 buildings have been restored in the past eight years and used as museums, restaurants and shops. The next century is a challenge to Dubai architects to coincide between new materials and designs on the one hand and reference to culture, climate and environment on the other hand.